As Nate "Baze" Bazile on Life Unexpected, Kristoffer Polaha plays a key role on one of the best reviewed new shows of the mid-season. On the pilot episode, his character learns he's the father of a 15-year old girl; this would be shocking, troubling news for anyone, let alone a guy who lives above a bar and sleeps until noon everyday. On reading the script: I responded to Baze. I was at a reading and was just like 'Oh.' It's interesting, as an actor when you read scripts you either immediately start making choices, like, 'I'd play it this way,' and you can start seeing the scenes in your head or it takes you some time to get into the flesh of that character. With Baze it was immediate. On spoilers for his character: Baze starts out in the pilot as the archetypical boy-man, the guy who doesn't grow up. He's got Peter Pan Syndrome bad and he meets his fifteen year old daughter. She comes knocking on his door and he's like, 'Who are you,' and it turns out that she's his little kid. Pretty immediately from that moment on he takes responsibility for this little kid. This is sort of an unspoken thing but as an actor it's the choice I've been playing for this character, which is that he immediately decides to protect her and love her. He's like, 'I didn't know that I had this but now that I do I'm going to do right by it.' But what's funny and what's sad about Baze is that he's ill equipped to do right. So he kind of tries and keeps messing things up and so you'll see a lot of hijinks from Lux and Baze. There's definitely some unresolved sexual tension between Cate and Baze which you'll see played out. 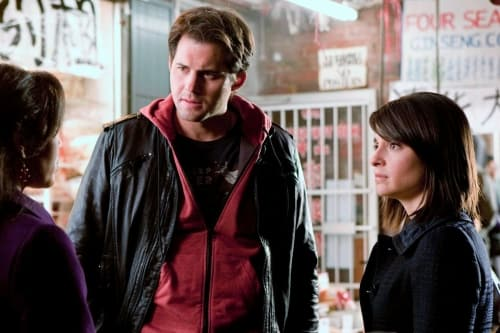 Life Unexpected premieres on January 18 on The CW.